I tried preparing Siu Yuk for one of the Gourmet Club events; the theme wasTechne. The challenge is that the skin must be crispy but not too tough, and the meat must be soft and juicy. I decided to combine a few techniques, including applying cure on the skin, drying it overnight in the fridge, and roasting it over a tray of water. Use kitchen tweezers to pull out stray hair on the pork belly skin. Use a knife to scrap the skin to remove impurities. Rinse pork belly and pat dry with paper towels. Stab the skin with a small knife, making short diagonal slits on the surface of the skin, be careful not to cut into the meat. Turn the pork belly over, skin-side down. Score the meat lengthwise 1 finger deep, do not cut into the skin. Combine (A) in a small bowl and rub the marinade all over the meat portion only, rub marinade into the scores. Avoid getting the marinade on the skin. Combine (B) and apply the cure on the skin. 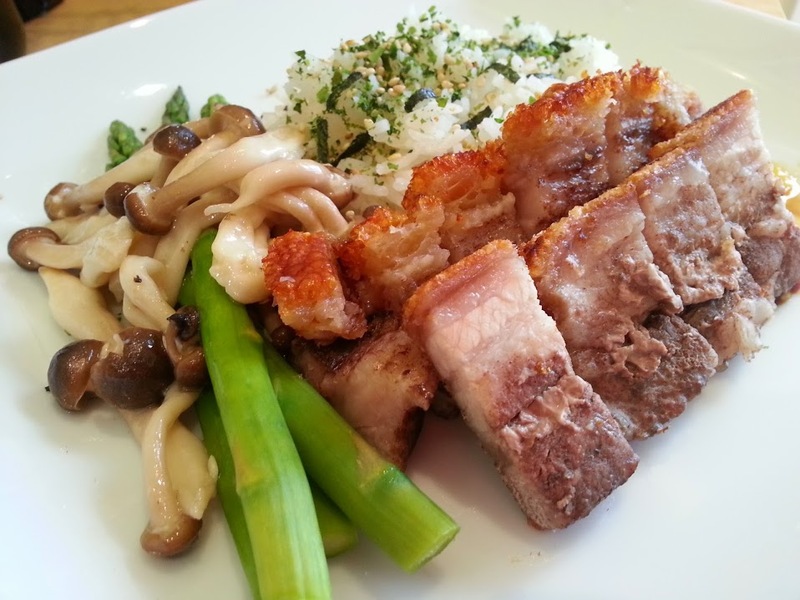 Place pork belly on a plate, uncovered, skin-side up and let it marinade overnight in the refrigerator. This will dry the skin thoroughly and marinade the meat. When ready to roast, apply cure again on the skin. Place a wire rack in the center of a semi-deep roasting tray. Fill the tray with some water and place the pork belly on the wire rack, skin-side up. Roast the pork belly at preheated oven of 220°C (428°F) for 30 minutes, the skin will start to blister and the parts without blisters feels soft when poked with a bamboo skewer. Using a few bamboo skewers bunched together, poke as many holes as you can on the portion of the skin which is still soft. Return pork belly to the oven and roast at 200°C (392°F) for another 90 minutes, or until the skin is fully roasted and crispy. At 30 minutes intervals, top up the water in the tray and poke holes with bamboo skewers on the portion of the skin which is still soft. Remove from oven and let the cooked pork sit on the wire rack for 15 minutes before cutting. Place the meat on a chopping board, skin-side down. Slice into strips according to the scores, and further cut the strips into smaller, bite-sized pieces.